More than just fancy #lettuce, these #greens are refreshing, filling, extraordinarily low in calories, and provide much-needed nutrients. Here are a few “green” #health and purchasing tips from some top foodies to use on your next trip to the supermarket or farmers’ market. Health Perks: It’s a source of vitamin C (5 percent of daily values) and folate. And it’s also packed with vitamin K (10.9 micrograms). Some recent studies suggest that the combination of calcium, vitamin D and K is better for bone health than calcium alone or calcium plus vitamin D. Vitamin K helps bone actually hold onto the calcium it has. 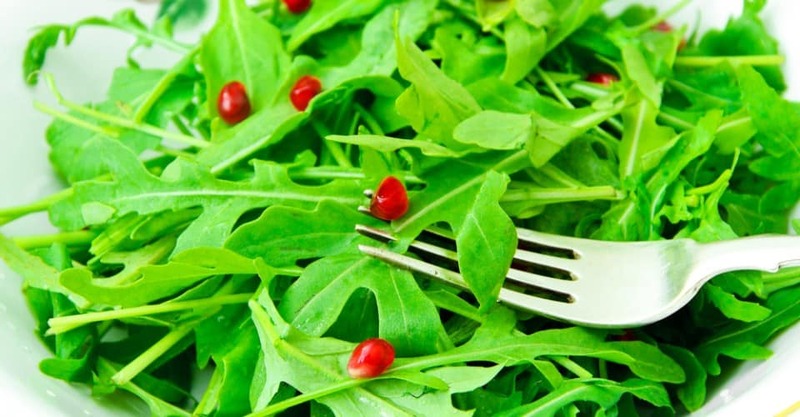 Arugula has about 32 milligrams (3 percent of daily values) of calcium and a decent supply of magnesium, phosphorus and potassium. It also has significant quantities of beta carotene (for healthy skin and eyes), lutein and zeaxanthin (for healthy eyes). Like all leafy greens, it is linked to a reduced risk for cancer when eaten as part of a healthy diet. Nutrition Stats: 1 cup: 5 calories, 0.13 g fat, 0.73 g carbs, 0.3 g fiber, 0.52 g protein, 32 mg calcium, 3 mg vitamin C, 475 IU vitamin A. Use: “Best used in a mix of baby #salad greens but can stand alone as the basis for a salad. Delicious with sliced fresh pears and goat cheese,” says nutritionist Maria Walls, R.D. Purchasing: Available early spring through summer. Look for young, tender leaves. “Older leaves are shorter and tougher with a more peppery taste,” says Walls. Storage: Wash thoroughly. “It grows in sandy soil, so it needs to be rinsed well in cool water. Dry on paper towels, wrap in plastic wrap and store in the refrigerator crisper. Use within two days,” Walls adds. Appearance: Sturdy, coarse leaves with a large rib down the center. Leaves range in color from dark green on the outside to a light green at the inner core. Taste: Mild, with a crisp texture. Outer, darker green leaves tend to have a stronger, more bitter taste. Health Perks: It’s rich in vitamin K, vitamin A (55 percent of daily values wow), beta carotene, lutein, zeaxanthin, vitamin C, folate, manganese, potassium and fiber. In fact, romaine lettuce is quite the health food. “The American Institute for Cancer Research lists it as one of the foods that helps fight cancer due to its antioxidant capabilities,” says Walls. Nutrition Stats: 1 cup shredded: 8 calories, 0 g fat, 0.52g carbs, 1g fiber, 0.58 g protein, 16 mg calcium, 11.3 mg vitamin C, 2,729 IU vitamin A. Use: Most often used as the standard lettuce in Caesar salad. Also delicious in a salad with apples and walnuts. Purchasing: Available year-round. “Avoid heads with signs of rust or very dark green leaves with milky stems, which are signs of older lettuce,” says Walls. Storage: Store unwashed whole heads in plastic bags to retain crispness. Keep away from fruits that produce ethylene such as apples. Use within five to seven days. Appearance: Comes in small, round, cabbage-like heads. “Radicchio is a leafy vegetable. The more common variety has red leaves with white veins, but it can also be white or green speckled with red. Leaves vary depending on type, from rounder leaves resembling butterhead lettuce to a more elongated type that resembles Belgian endive,” says Walls. Taste: Tends to have a mildly bitter taste that mellows when cooked. Health Perks: Contains potassium and folate. Reportedly has high levels of antioxidant activity similar to other dark-colored fruits and vegetables such as blueberries and strawberries, which helps reduce damage from free radicals. Nutrition Stats: 1 cup shredded: 9 calories, 0 g fat, 1.79 g carbs, 0.4 g fiber, 0.57 g protein, 8 mg calcium, 5 mg magnesium, 16 mg phosphorous, 121 mg potassium, 24 mcg folate, 102 mcg vitamin K.
Use: Primarily in salads in the United States. In Italy, where it originates, it’s also grilled with olive oil or cooked in risotto and pasta. Storage: Keep in a cool, dry environment separate from other vegetables that tend to be moist. Best stored between 34 and 36 degrees. Appearance: Narrow, dark green, flat, almost spoon-like leaves that broaden at the top. The leaves form clusters (often referred to as rosettes) at soil level. Taste: Has a tender texture and a mild, delicate taste that can become bitter as the leaves age. Some varieties can have a hazelnut-likeflavor. Health Perks: According to Susan Moores, M.S., R.D., a Saint Paul, Minnesota, nutritionist, mache is said to have “stimulant, diuretic and laxative effects” and is an excellent source of vitamin A and C, iron, folic acid and zinc. Additionally, it’s known for its potassium and B6 content. Overall, mache has many benefits for blood pressure, heart health, brain health and the immune system. A 3-ounce serving contains 12 percent of daily values for omega-3 fatty acid, which is vital for circulatory health and a proven way to reduce the risk of heart attack. Nutrition Stats: 1 cup: 20 calories, 0 g fat, 3.3 g carbs, 1.3 g fiber, 1.3 g protein, 66 mg calcium, 2.4 mg iron, 47.5 mg vitamin C, 1,650 IU vitamin A, 363 mg potassium. Use: In salads, used alone or in combination with other tender leaf lettuces. “Partnering with flavors that are too strong masks or overpowers its subtle nature. Like spinach, it can be eaten cooked or raw. Great in omelets, soups, grain and potato salads,” says Moores. Purchasing: Pick bunches of leaves that look crisp and glossy with an even green color. Storage: Wash, drain and dry. Store wrapped in paper towels in an airtight plastic bag. It has a short shelf life. Wilted leaves and age cause bitterness. Use within one to two days.